Note: We offer a 35% Coupon Code (ANYBBP) for you. It is valid for only 7 days. DVD Toolkit for Mac is the unparalleled and all-in-one DVD software, which includes DVD Ripper for Mac, Video Converter for Mac, and Mac iPhone Transfer Platinum. With the DVD Toolkit for Mac, you can convert any DVD movies and video files to most popular video formats like MP4, MPG, MOV, M4V, AVI, WMV, FLV, ASF, SWF, MKV, and 3GP, etc on Mac with super fast speed and high quality. Also you can transfer files between iPhone and Mac as you wish. 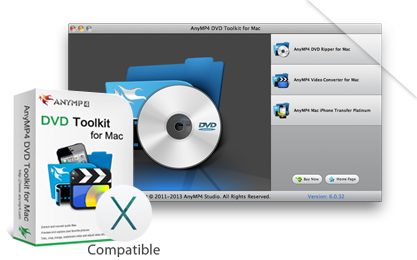 DVD Toolkit for Mac is capable of ripping DVD to most popular video formats such as MP4, H.264, AVI, WMV, FLV, MKV, 3GP, VOB, MOV, DPG, etc on Mac. It even supports HD videos like HD H.264, HD AVI, HD MPG, HD TS, HD MOV, HD ASF, etc. Then, you can transfer them to your loved portable devices. You are enabled to covert videos and audios to whatever you like with the help of DVD Toolkit for Mac. It supports most popular video and audio formats like AVI, MP4, M4V, MP3, MOV, AAC, ALAC, and AIFF, etc. This software allows you to transfer files between iPhone and Mac, and iPhone/iPad/iPod/ without any limitation. Also, you can export files from iPod, iPhone or iPad to iTunes on Mac. In this way, you can back up the important iPhone Contacts and SMS on Mac. If you want to enjoy the music from video, DVD Toolkit for Mac can help you to extract audio tracks from video files and convert them to any popular audio format such as FLAC, WMA, AAC, AC3, AIFF, AMR, MP3, M4A, MKA and OGG. You can adjust the video effect including Encoder, Frame Rate, Resolution, Aspect Ratio and Video Bitrate to meet your needs. With the help of DVD Toolkit for Mac, you're allowed to trim the video length, crop video frame, merge a few clips into one file, and add text/image watermark. The DVD Toolkit for Mac has the ability to modify the video settings like Encoder, Frame Rate, Resolution, Aspect Ratio and Video Bitrate and the audio settings like Encoder, Sample Rate, Channels and Audio Bitrate are also adjustable as you wish. You are allowed to select the subtitle and audio track if there're a few subtitles and audio tracks for you to select. You are enabled to preview the original and output video effect during the editing process. 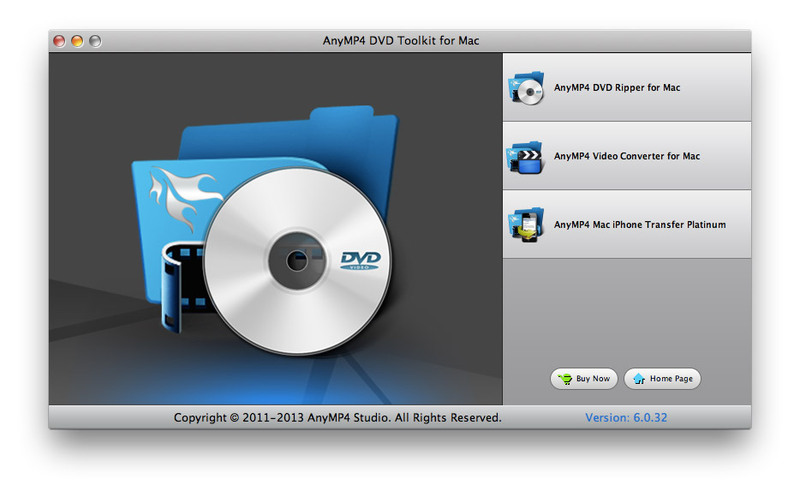 The DVD Toolkit for Mac has the user-friendly interface and users can easily finish all the process. And the editing process can be finished with a fast speed. clicks. It's very easy to use even for the beginners. This software will automatically to upgrade to a new version when it's connected to Internet. News | About | Copyright @ 2012 - 2015 Mac DVD Ripper. All Rights Reserved.